The main difference between system architecture and software architecture is that the system architecture is a conceptual model that describes the structure and behavior of a system. In contrast, software architecture is a high-level structure that defines the solutions to meet technical and business requirements while optimizing the quality attributes of the software. Architecture explains various aspects of a system. The system architecture defines the structure and behavior of an entire system. On the other hand, software architecture defines solutions to meet technical and business expectations while focusing on quality attributes such as performance, security, etc. In brief, software architecture is a type of system architecture. The system architecture is a conceptual model that describes the structure and behavior of a system. A system generally consists of multiple components and subsystems. They all operate together to implement the entire system. A system architecture description is a formal description that explains the structure and the behavior of the entire system. Furthermore, it is Architecture Description Languages (ADL) that helps to describe the system architecture. There are various types of system architectures. Some of them are as follows. Hardware architecture– Describes the systems’ physical components and their association. Enterprise Architecture – Describes the practices to carry on analysis, design, planning, and implementation of enterprise level applications. It helps to complete the application successfully using various strategies. Collaborative system architecture – Describes the interconnections among components of the system. Some examples are the Internet, joint air defense systems, intelligent grid etc. 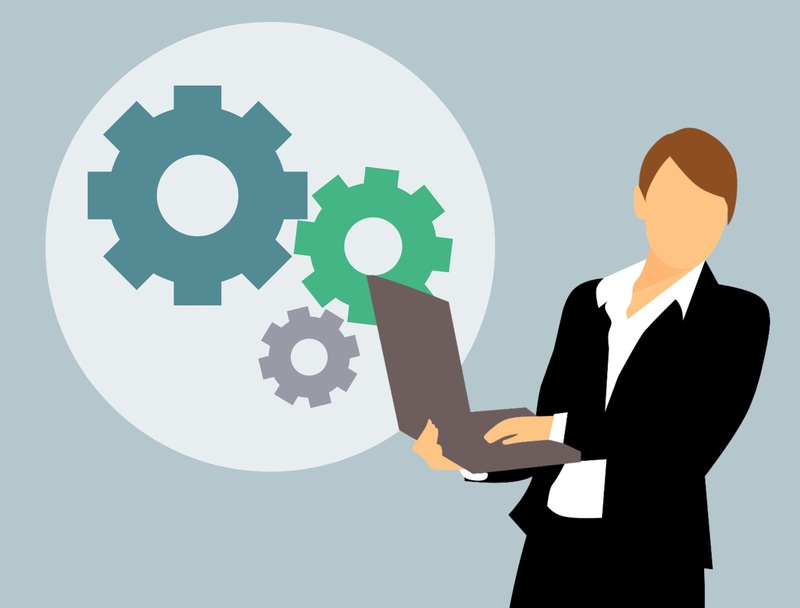 Software architecture is a high-level structure that defines the solutions to meet the technical and operational requirements while optimizing the quality attributes such as performance, security, and manageability. There are many quality attributes that affect the software architecture design. They define the requirements and expectations of a software in operational and technical levels. It is important to consider attributes such as performance, fault tolerance, scalability, and reliability. In the end, the final software product developed using software architecture should be flexible, easier to use, maintainable and reusable. The quality attributes are also called characteristics. There are various software architecture patterns, and some of them are as follows. Software architecture is a type of system architecture. The system architecture is a conceptual model that defines the structure, behavior, and view of a system. Software architecture, in contrast, refers to the high-level structure of a software and discipline of creating such structures and systems. Thus, this is the main difference between system architecture and software architecture. 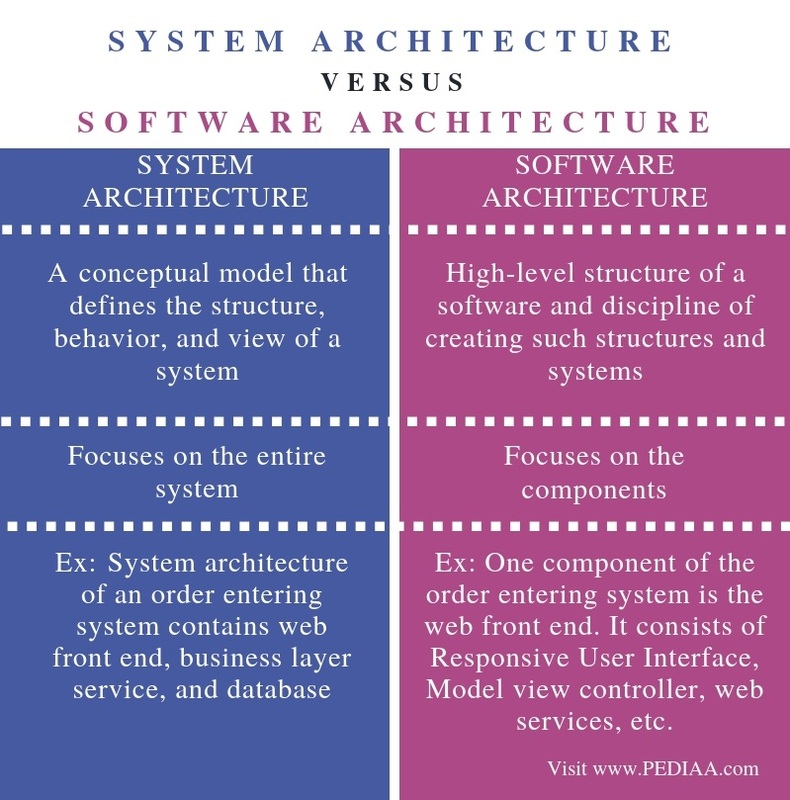 Another difference between system architecture and software architecture is that system architecture focuses on the entire system whereas software architecture focuses on the components. Moreover, an example will help you to understand the difference between system architecture and software architecture more clearly. The system architecture of an order entering system contains web front end, business layer service, and database. On the other hand, one component of the order entering the system is the web front end; moreover, it consists of Responsive User Interface, Model view controller, web services, etc. The system architecture is a conceptual model that describes the structure and behavior of a system while software architecture is a high-level structure that defines the solutions to meet technical and business requirements while optimizing the quality attributes of the software. This is the main difference between system architecture and software architecture. 1. “Systems Architecture.” Wikipedia, Wikimedia Foundation, 22 Nov. 2018, Available here. 2. Aladdin, Mohamed. “Software Architecture – The Difference Between Architecture and Design.” Codeburst, 27 July 2018, Available here.